The Vitara Brezza is Maruti's contender in the sub 4-metreSUV segment. It competes against the likes of the Ford EcoSport, Tata Nexon and Honda WR-V. The side profile of Vitara Bezza portrays a cut-to-cut stance with no soft corners. All the three A, B, and C pillars are done in black, and so are the fenders. Only the ZDI variant gets the option of dual-tone colour. All Vitara Brezza variants expect the base LDI option gets roof rail. LED stoplamp accompanies the roof spoiler in all four trims. The boot lid gets chrome garnish with the car name embossed in bold. 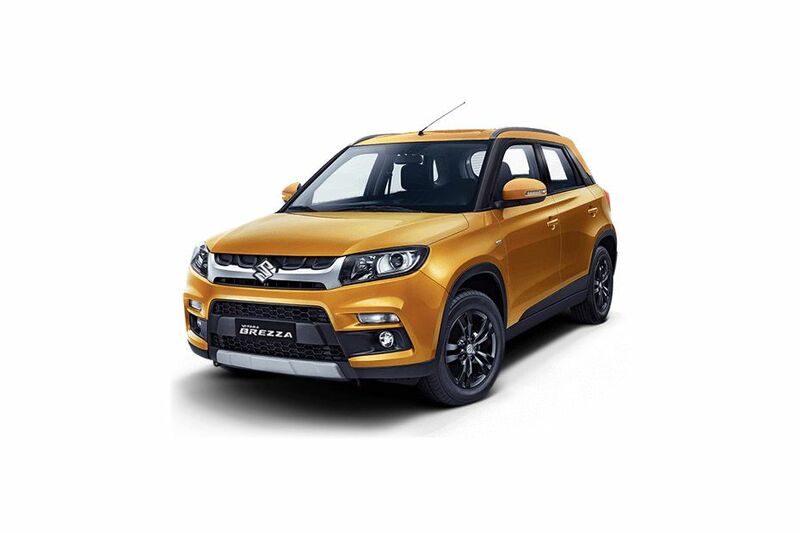 Vitara Brezza features bold front grille that is accompanied by faux air intakes. The projector headlamps get 'Bull Horn' LED lighting in ZDI and ZDI variants. Also, the two high-end trims get front fog lamps. The rear of Vitara Brezza depicts a bold yet clean image. The ZDI and ZDI trims get rear washer and wiper. However, the one one the ZDI comes with auto rain sensing tech. The bumper is done in matte back and houses the reflectors. The Vitara Brezza gets an all-black cabin layout with some silver and piano black inserts thrown around for added detailing. The 3-spoke steering wheel is similar to what is seen on the Ciaz. It gets chrome accents on the edge of each spoke. However, there is no leather-wrapped option on any trim. The top-end ZDi+ variant comes with push-button start/stop for keyless ignition. The button has a chrome ring surround. The left spoke of the steering has buttons for controlling the music system. These include volume controls, track controls, mute, and audio source switch. The steering-mounted buttons are available only in the ZDi and ZDi+ variants. Vitara Brezza gets roof rail spoilers in all its variants. The car gets its antenna setup at the front-center end of the roof. The front-end gets a prominent chrome grille with matte blackU-shaped tethers above it. A massive Suzuki S-logo sits in the center. The circular fog lamps seen here are available only on the ZDi and ZDi variants. Also visible is the horizontally placed turn indicator just above the fog lamp housing. The Vitara Brezza is one of those rare designs where the turn indicator is located outside the main headlamp assembly. The ZDi and ZDi variants come with projector headlamps and 'bull-horn shaped' LED light guides. Lower trims are offered with conventional halogens. The taillights are divided in two sections - one is located on the rear side fender while the other is a part of the bootlid. It also features the 'bull-horn' light guides seen in the headlamps. The twin-pod instrument cluster gets squarish tachometer and speedometer dials with rounded corners. On the ZDi and ZDi+ variants, these dials come with mood lighting, with owners getting the option of choosing from 5 colours:yellow, orange, red, white and blue (seen here). The MID screen in the center includes a digital odometer, fuel and temperature gauge, clock, outside temperature, two tripmeters, distance to empty, and average & instantaneous fuel economy. All the variants of Vitara Brezza get reverse parking sensor. The VDI, ZDI, and ZDI trims come with infographic display of the parking status. The ZDI is the only option to feature a reverse parking camera. The outer rear view mirror on Vitara Brezza comes integrated with turn indicators on the ZDI variants. Other trims have front turn indicators on the bumper. In the dual-tone options the OVRM matches the roof colour. The Vitara Brezza is a clean and matured design. It lacks any aggressive cuts and creases and thus is expected to age well. The rear bumper features a matt black cladding which houses reflectors. The exhaust pipe is neatly tucked under the bumper. Also, the rear parking sensors present in all variants are placed above the bumper. There are plenty of storage spaces across the Vitara Brezza's cabin. The most useful ones are these cup holders next to the handbrake and a space for your smartphone ahead of the gear lever. The top-end ZDi variant comes with rain-sensing wipers and automatic headlamps. After the latest update, the Vitara Brezza now gets blacked-out alloy wheels on the ZDi and ZDi trims. These 16-inch wheels are wrapped with 215/60 section tyres. Regular Maruti Suzuki power window controls. The driver window switch is illuminated and gets auto up/down and anti-pinch functionality as well. It is available in a total of 4 variants - LDi, VDi, ZDi and ZDi ,all powered bydiesel engines. TheFiat-sourced 1.3-litre, four-cylinder engine is capable of generating 90PS and 200Nm of torque. It is offered with a 5-speed MT gearbox as standard and an AMT automatic in the VDi, ZDi and ZDi variants. A rather long roof-mounted antenna is located at the front. It is offered as standard on all variants. Vitara Brezza shows off a muscular stance that looks great with its floating roof design. Its 198 mm of ground clearance adds to its functionality as a crossover. All the four Vitara Brezza variants get 16-inch wheels. The LDI and VDI trims get steel, while the ZDI and ZDI get all-black alloy wheels. Vitara Brezza gets split rear combination taillamps. The ZDI and ZDI variants get 'Bull Horn' LED light guides. Vitara Brezza looks bold. It is adorned with design elements like projector headlamps, fog lamps (ZDI and ZDI ), blacked out side skid and pillars, and prominent fenders. The Vitara Brezza has a wheelbase of 2,500mm. It offers decent amount of legroom for a sub 4-metreSUV. The space on offer at the rear seat is clearly superior to its chief rival,the Ford EcoSport. Black cladding runs from the front all the way to the rear. The fenders get a boxy appeal and house 16-inch wheels. A black and chrome side skid (only in VDi and VDi ) contribute to its already powerful appeal. The base variant, LDI, and VDI get the same black cladding running to the entire length of Vitara Brezza. However, the side skid features an all-black strip with no chrome input. Vitara Brezza gets a sectioned bold front grille with Suzuki logo in the center. The front bumper is wide, features faux air intakes, and has space for the number plate. Maruti offers iCreative customization package with Vitara Brezza. The top-variant, ZDI , can be ordered in stunning dual-tone exterior colour options. Vitara Brezza displays a floating roof design, thanks to which the car benefits from aerodynamic pros. The bonnet is wide and features sharp contour line. Vitara Brezza offers a boot space of 328-litres. The ZDI and ZDI variants get illumination option in the luggage area. The boot lid is decorated with a chrome plate on which is embossed car's name. Beneath it is space provided for rear number plate. The split rear combination taillights are the perfect companion for highway rides. They illuminate well, making the car's presence felt to the remotest of the vehicles at the back. Vitara Brezza showcases a bold front profile. The sectioned grille, massive faux air intake and striking headlights contribute to its looks. The black cladding going all the way to the rear gives it an SUV-like appeal. Under the iCreative package, Maruti offers the ZDI of Vitara Brezza in three dual-tone exterior colours. Apart from the basic white, silver, and grey options, the ZDI trim is available in Blazing Red with Midnight Black roof, Autumn Orange with Arctic Pearl White Roof, and Fiery Yellow with Arctic Pearl White Roof. Maruti Suzuki gives buyers a chance to personalize Vitara Brezza. It starts with choosing the variant, colour tone, and lasty exterior, interior, and add-on features. The Brezza is available in 6 basic colours:Pearl Arctic White, Blazing Red, Premium Silver, Autumn Orange, Fiery Yellow, and Granite Grey. Additionally, the Orange, Yellow and Red colours can be opted with contrasting roofs, giving the car a dual tone scheme. However, this option is available only in the top-end ZDi variant. On the inside, Vitara Brezza gets ample amount of legroom both at the front and rear. The seats feature patterned fabric upholstery. There are multiple storage options present inside. Vitara Brezza is available with a single engine option of 1.2-litre. The power is sent to the rear vehicles either via 5-speed manual or 5-speed automatic transmission. The LDI and VDI variants feature a manual air-con system, while the ZDI and ZDI get one with an automatic function. The range-topping Vitara Brezza trim gets a Smartpaly Infotainment System with Apple CarPlay, Android Auto, and MirrorLink. Maruti has provided Vitara Brezza with multiple and smart storage options. Cupholders follow the gearbox and then comes the cenre armrest with storage compartment.